It was Dec. 6, 2012, and Marcus Robicheaux, like the other inmates at the Iberia Parish Jail, was standing with his hands on his head and his nose pressed against the wall of the recreation yard as correctional officers ran a contraband sweep. Suddenly, one deputy pulled Robicheaux from the wall and threw him to the ground. The deputy’s dog then attacked Robicheaux, biting his legs, arms and torso, and the deputy joined in, stomping and kicking the prone inmate. 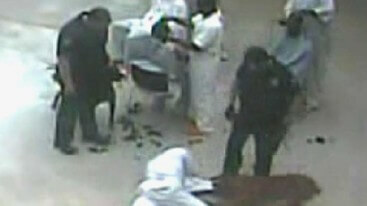 The whole three-minute incident was captured on video from the jail’s surveillance cameras. Continue reading article at The Advocate.com. As a victim of police misconduct, you need an attorney. Call the Law Offices of L. Clayton Burgess to speak to a skilled attorney about inmate abuse/police misconduct.